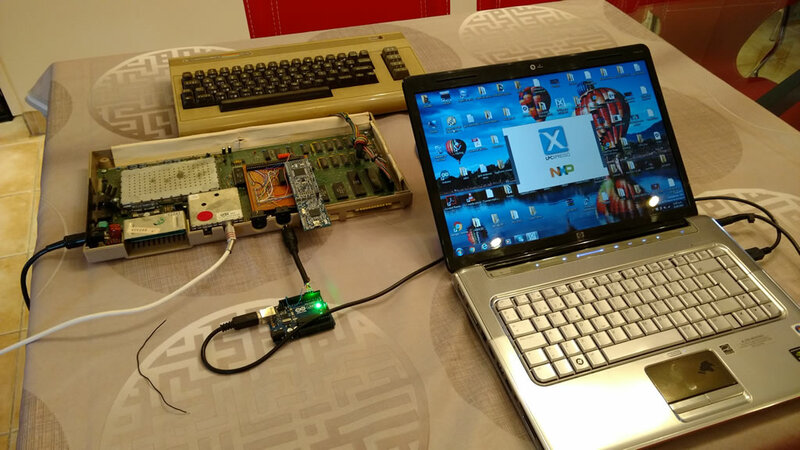 A software core for the C64 it's possible. 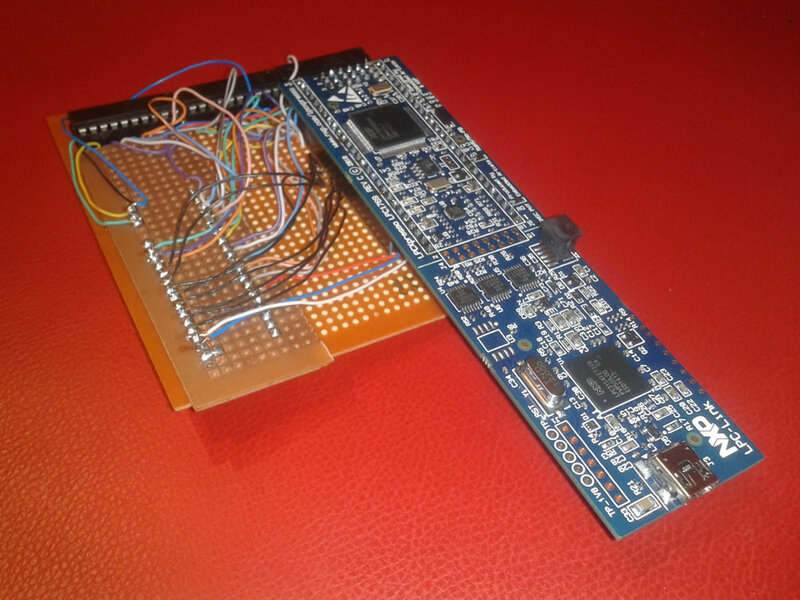 Unlike other implementations based on programmable logic (FPGA) and soft-cores, this is a 32-bit microcontroller running a 6510 emulator. 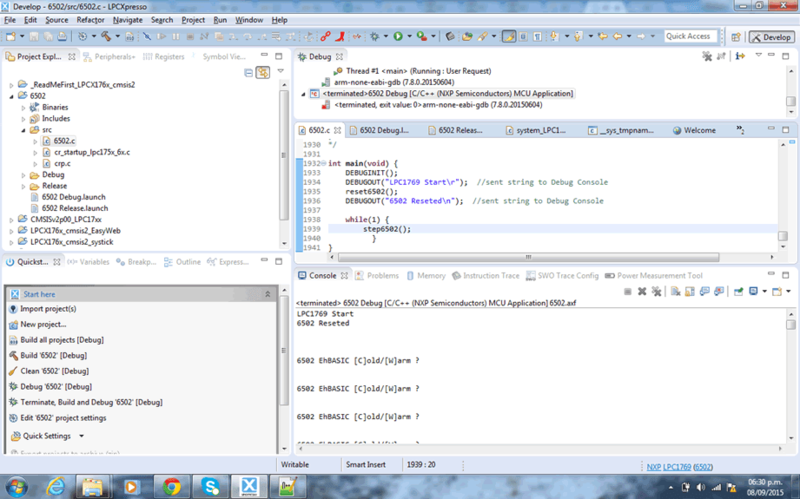 So I call it software-core, no soft-core. 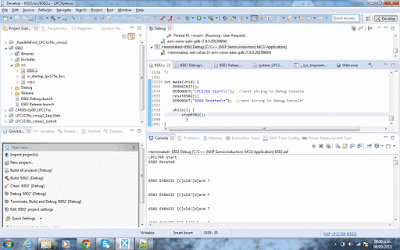 For easy reconfigurability, a portable C programed microprocessor emulator is used resulting in a "High-Level Languaje In-Circuit Emulator". 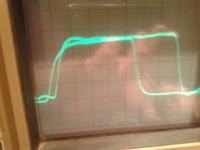 This is a spacetime emulator use, space because in-circuit, and time because real-time operation (software running synchronized to an extrernal clock). 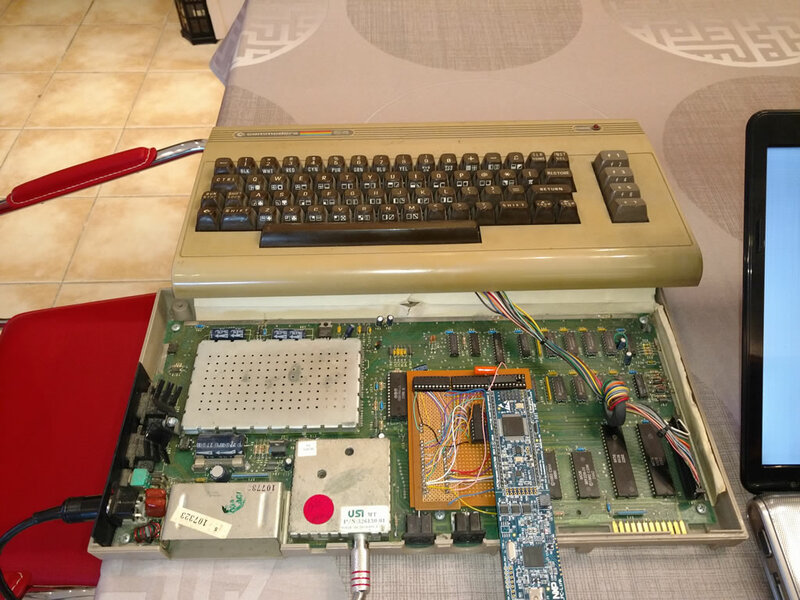 Watch the videos about a C64 with the 6510 microprocessor replaced with a 32-bit microcontroller: ARM Cortex M3 LPC1769. 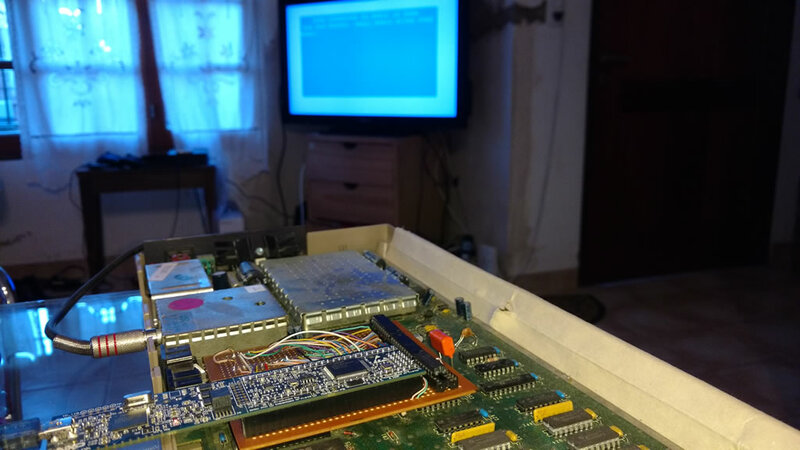 There are running games and IEC operation (via Uno2IEC). On Sept 2015 I saw miker00lz’s post at Arduino forum about runnig his 6502 emulator (fake6502) on Arduino (https://forum.arduino.cc/index.php?topic=193216.0). 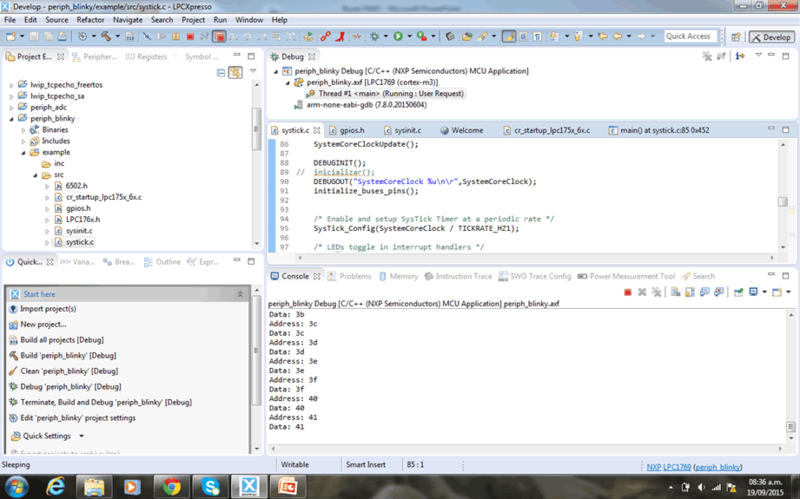 That was interesting but I thought it would be better if the microcontroller handle external SRAM, CIA or SID. Thinking that at some point Arduino would limit performance I choose a more powerfull platform: an NXP LPC1769, ARM Cortex 3. 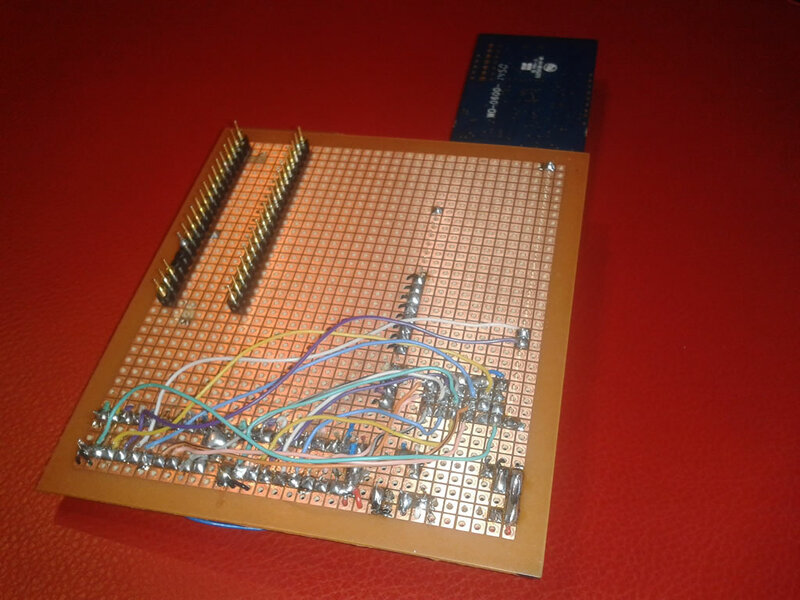 The LPC also has 5V tolerant GPIO pins needed by MOS chips. 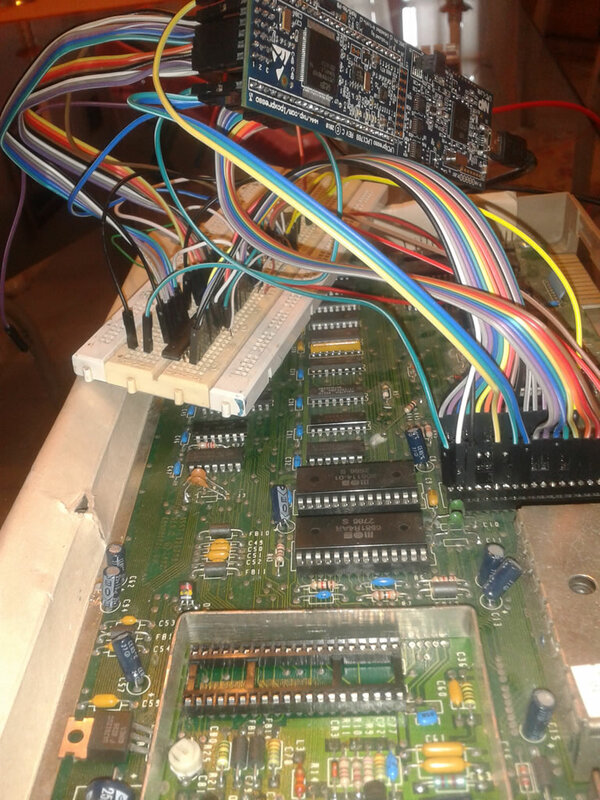 First test was with a 32k x 8 SRAM (HM62256) and fake6502 running EhBasic. 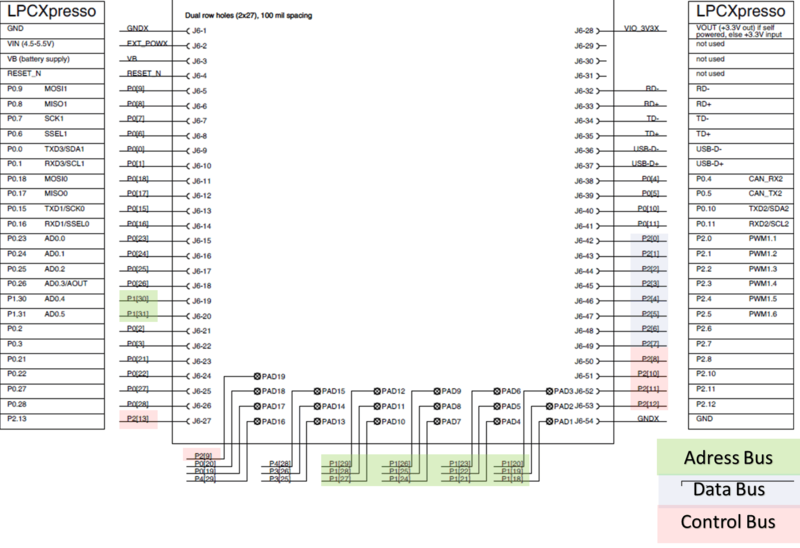 Then GPIO pins were connected to SRAM as 6502 buses, really an incomplete address bus (A0 to A13) beause only 14 contiguous GPIO pins available: P1.18 to P1.31. 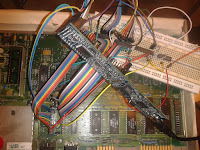 And memory read and write functions for fake6502 were written to manage the GPIO pins connected as address, data and control buses. 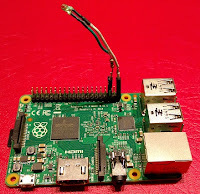 The pins connection was direct and the emulator ran asynchronously, EhBasic code was, like on the Arduino, contained as a C constant array in the microcontroller flash program memory. 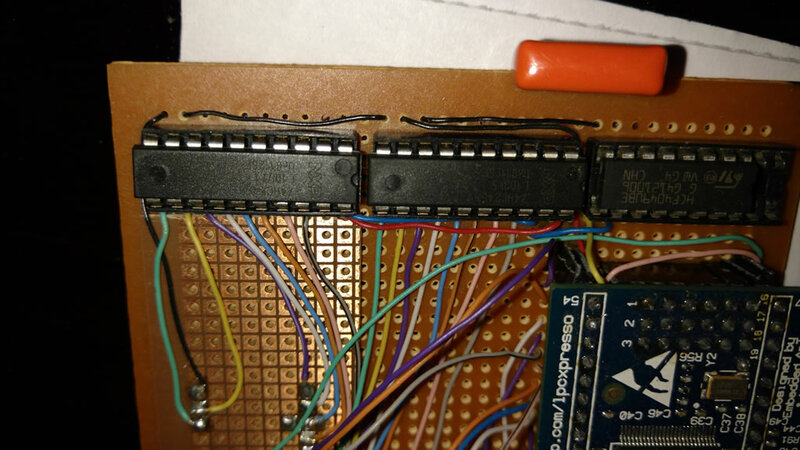 Then I wanted to reproduce 6502 operation reading program from a ROM, that is an external stored program, external to the microcontroller. One first option was to write EhBasic to a 29FXXX DIP Flash but I prefered to use C64 ROMs, so I retired from a C64 a socketed 901225 Characters ROM chip, connected it like the SRAM to the microcontroller and readed it. 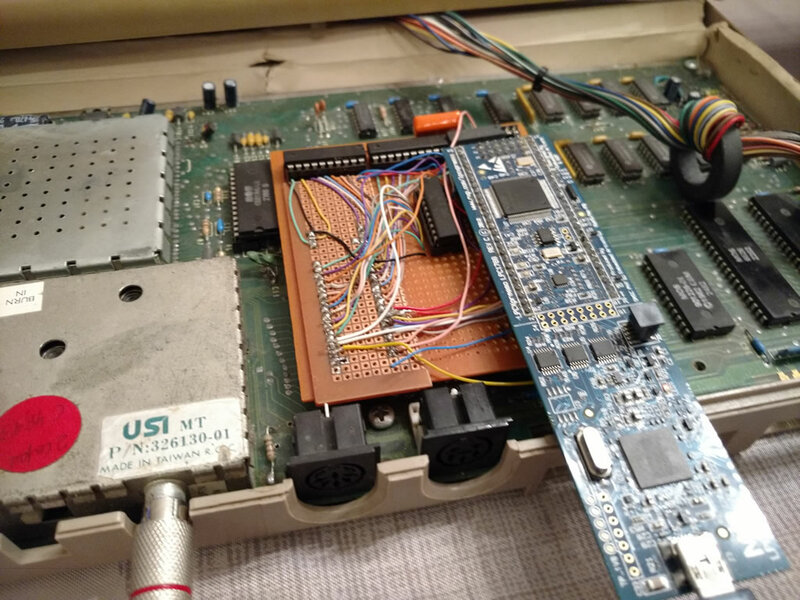 And then, one more step, what about connecting the microcontroller to the C64 replacing the original 6510 and test ROM, CIAs and SID with address decoding provided by the original PLA. It seems trivial but presents several difficulties because in the C64 the 6510 microprocessor shares the buses with the VIC video chip, the system RAM is DRAM refreshed by the VIC chip and we need to emulate 6510’s I/O port. 6510’s I/O port is mapped at $0001 address and, in C64, bits 0,1 and 2 connected to LORAM, HIRAM and CHAREN signals. 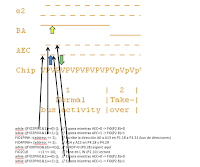 PLA use this signals for switching between ROM and RAM for $A000-$BFFF, $D000-$DFFF and $E000-$FFFF memory areas. 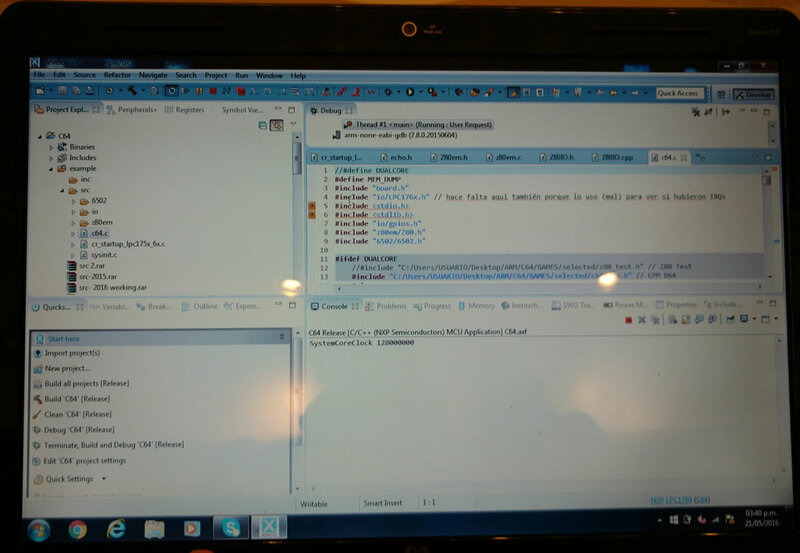 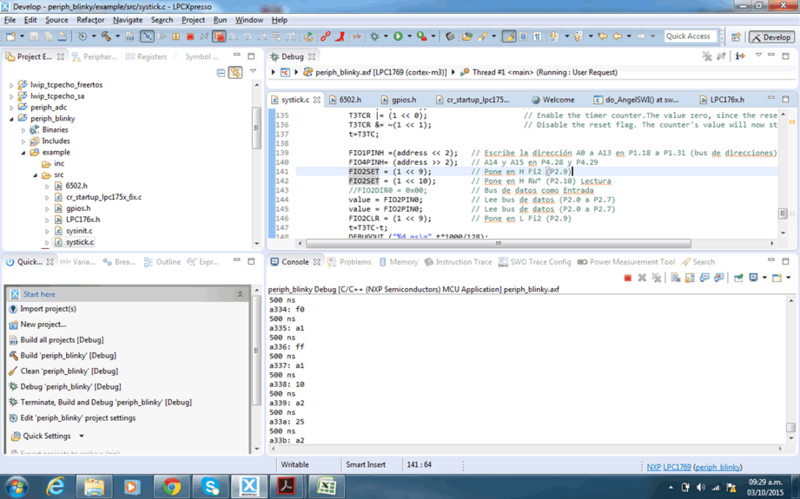 As VIC provides CLK for CPU up to here the emulator runs asynchronously. In order to place the VIC on the board and share buses the emulator needs third state capability and synchronization to system clock. In the C64 bus access is driven by VIC with it’s BA signal connected to 6510’s AEC pin. 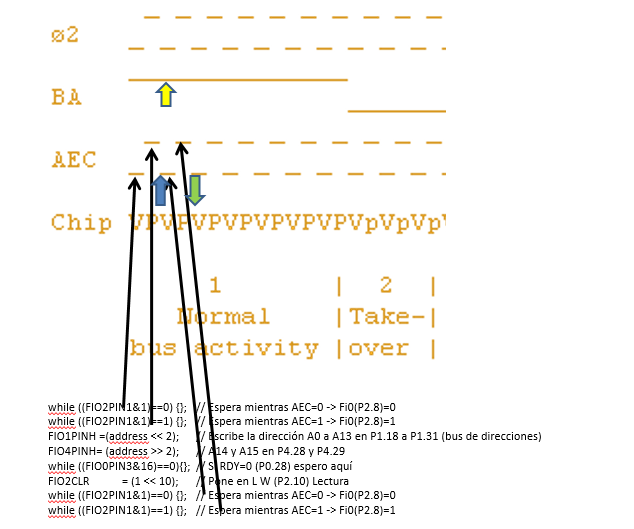 All microprocessor read and write operations take place when AEC=1 and must be enabled by the RDY signal too. 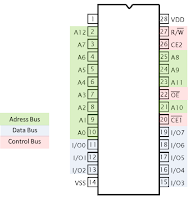 When AEC=0 VIC uses the buses and microprocessor pins must go to third state. 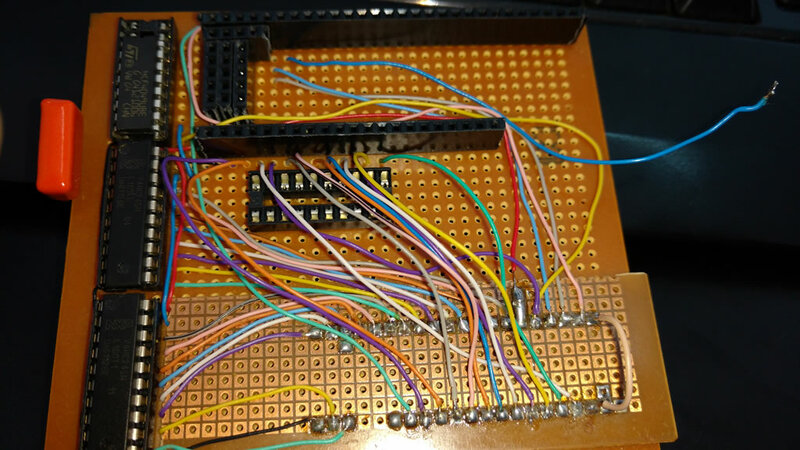 That operation was implemented using a custom interface adapter using discrete logic: 3 x 74HC245 Octal 3−State Noninverting Bus Transceivers for address and data bus and a 74HC00 for R/W. 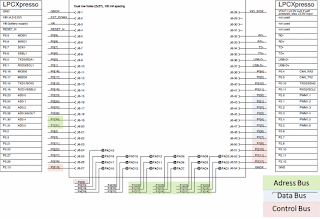 Two remaining 74HC00 gates were used to accommodate required delay between in and out 6510 clock signals. 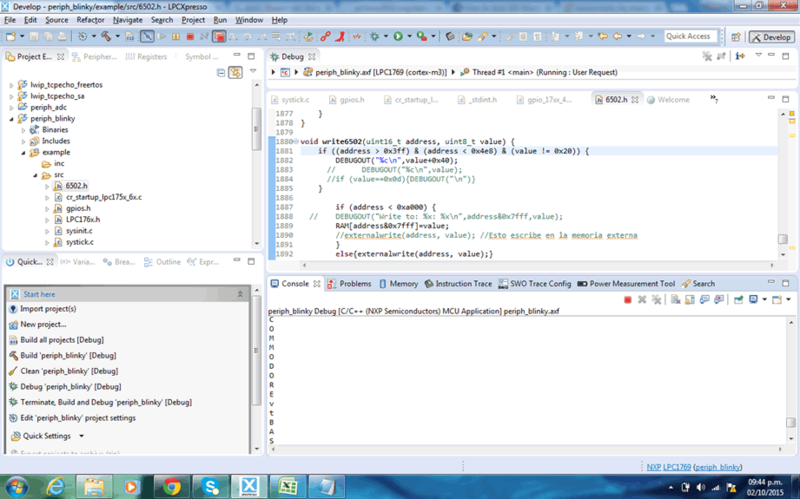 Also read and write functions were rewritten in order to take into account AEC and RDY states. 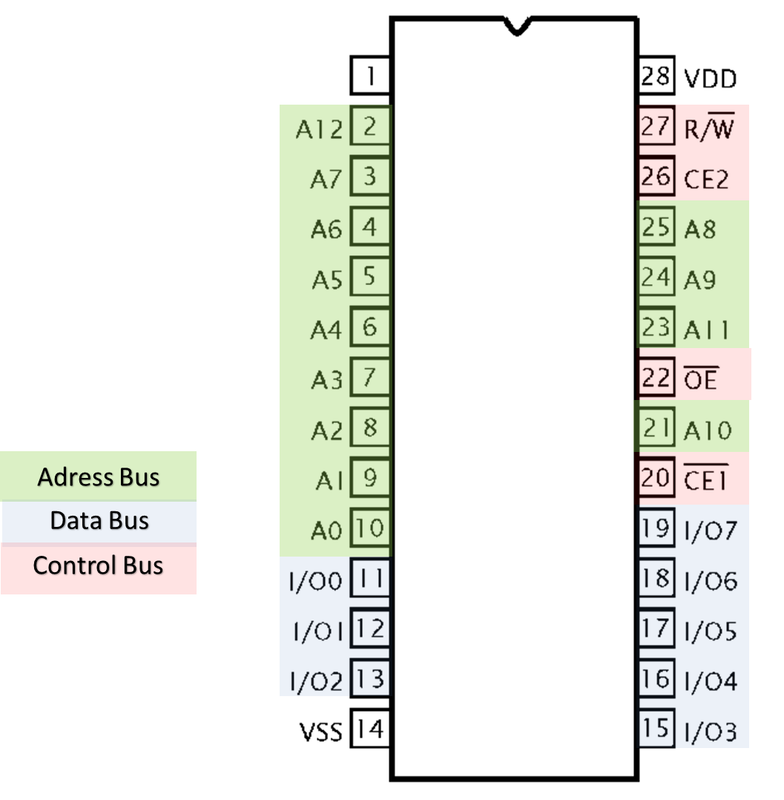 As 6510 only can access buses when AEC=HIGH all read and write operations are synchronized to that signal and not to Clk (Fi2). 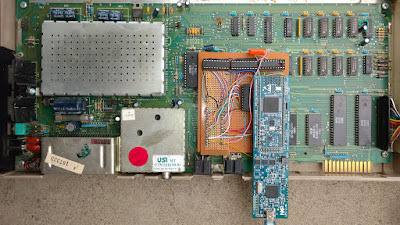 VIC chip was connected to the board and several time adjustments were made to read/write routines. 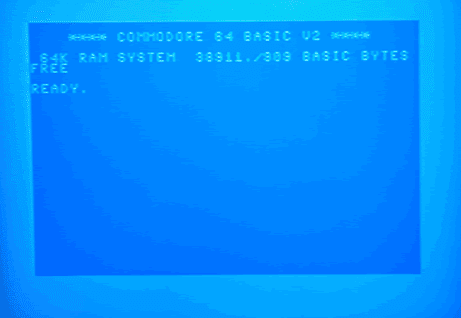 Incorrect timmings produced DRAM corruption during VIC refresh and access. 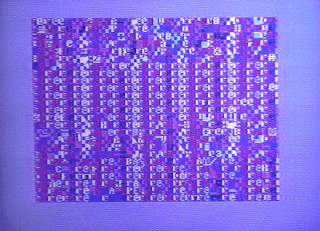 Finally I got the system running, a C64 with a software-emulated microprocessor! 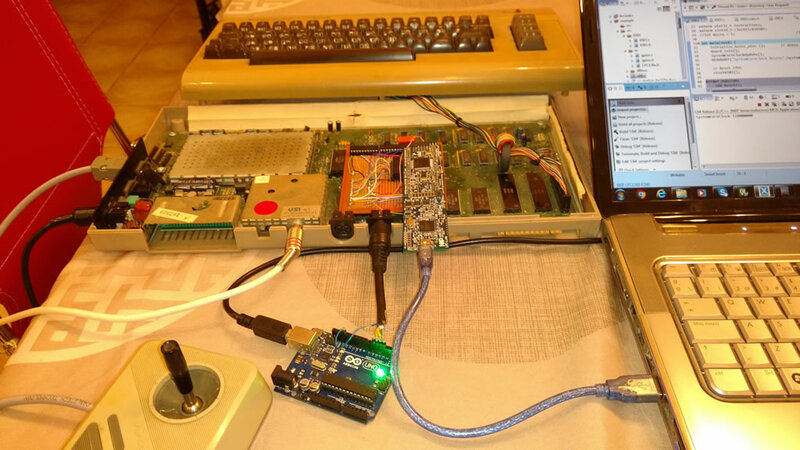 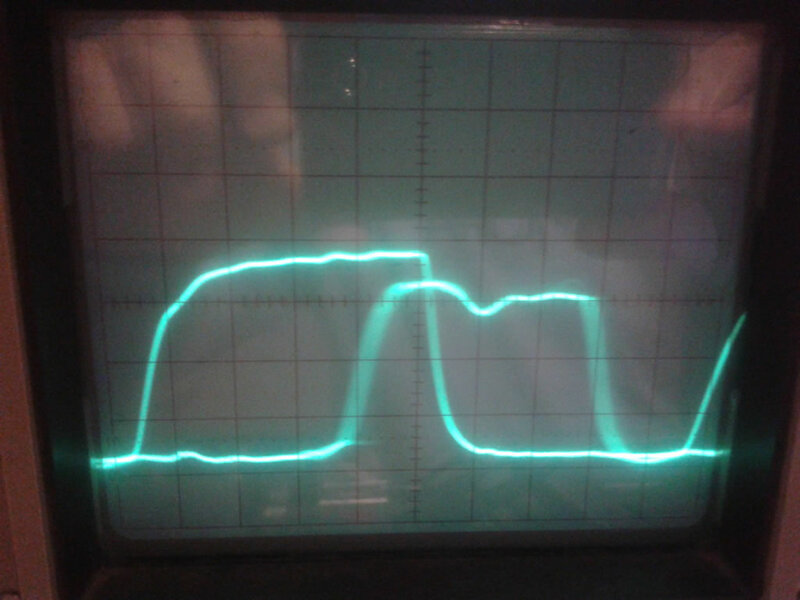 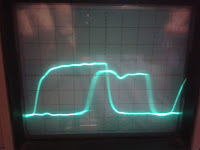 The shared bus access works fine even with the lower performance obtained, about 60%, respect to the original 1MHz 6510. Games and default IEC bus was tested using Uno2IEC, a 1541 IEC interface emulator using Arduino. 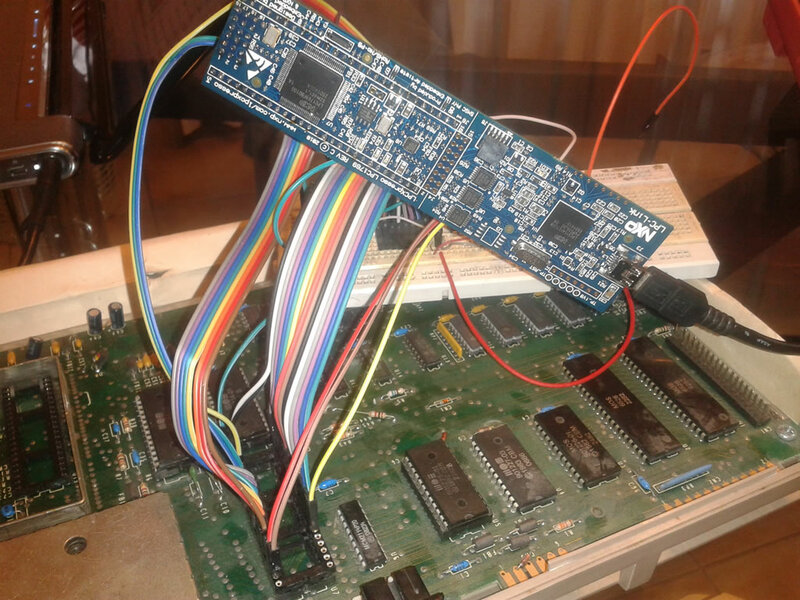 Of course better performance can be achieved using an assembly emulator, like a6502 (https://github.com/BigEd/a6502), but the idea is a "High-Level Languaje In-Circuit Emulator". 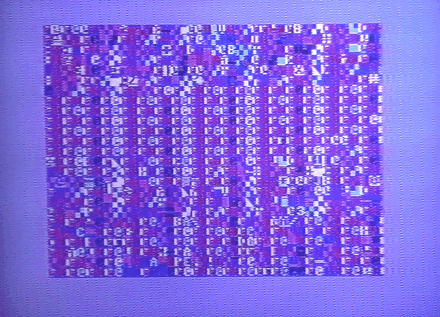 Utterly brilliant, really well done. Don't suppose your releasing the project at all are you?